In the spirit of the ongoing reform of the reform (and a personal kick in the proverbial pants to Bugnini and friends), I encourage all OnePeterFive readers to celebrate the traditional Octave of Black Friday. Customary devotionals during the Octave of Black Friday include eating turkey sandwiches, binge-watching Babylon 5 , and purchasing things for yourself while pretending to shop for Christmas gifts. In my recent Vigil of Black Friday reflection, I mentioned the too-often-repeated idea that all religion was superstition and fables, until somehow we were all saved by the Enlightenment and modern era. This idea is basically Gospel-truth among atheists. But even among the faithful it has a certain amount of cachet, causing many otherwise-proud contemporary Catholics to apologize for the past, and all those (you know) Crusades and Inquisitions and anti-science censorship campaigns. Never mind that this graph, and the worldview that goes along with it is completely insane. Never mind that many of the most important scientific advances of the modern era were made not just by faithful Christians but even by Catholic priests. Never mind that there wasn’t much of what we would really call “scientific advancement” in post-Greek ancient Rome. Never mind that the immediate effect of the classical Renaissance was a halt in development of learning and philosophy because the discoveries made in the last thousand years were seen as inconsistent with newly-idolized ideas of the Greek philosophers, no matter how wrong they were. Never mind all that — it’s a great chart, right? It shows us exactly why the Dark Ages were so dark. Though many of us know that this hysterical worldview is completely wrong, we may only have a vague sense of how wrong it is. I have become aware of just how wrong this anti-Catholic narrative of history is in the last year or two, and one of the best books to dispel these unfortunate mythologies is [easyazon_link asin=”1848311508″ locale=”US” new_window=”default” nofollow=”default” tag=”onep073-20″]God’s Philosophers: How the Medieval World Laid the Foundations of Modern Science, by James Hannam[/easyazon_link] . 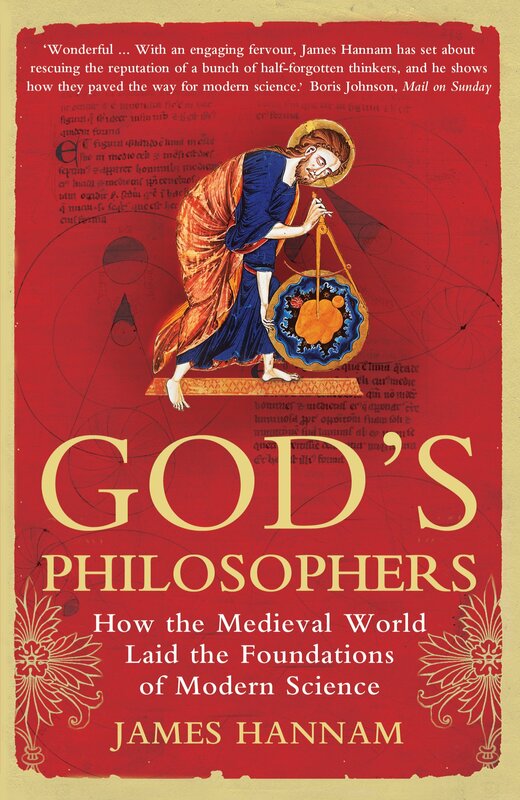 Hannam’s book tells the stories of the faithful men and women of the Middle Ages who carried on the work of scientific and philosophical inquiry, continuing and expanding the development of reason and logic that had begun with the classical Greeks. And he shows that they pursued these disciplines not in spite of their faith, but because of it. They were not operating at the fringes of a church that barely tolerated them, but within her heart and under her patronage. God’s Philosophers is a great gift for any history buff, church nerd, or obnoxious atheist. Or for yourself. Adam writes about philosophy, theology, libertarian politics, anarcho-capitalism, software development, the Open Source movement, Christian liturgy, and sacred music.